The furore over a mainland kid peeing in the street in Mongkok has become exaggerated out of all proportion. As Hemlock points out today, the poor kid has unwittingly become a symbol of all the grievances Hong Kongers feel over the uncontrolled flood of tourists overrunning their city. Make a list of all the public toilets you know in the area where you live or work. Imagine you are a visiting couple unfamiliar with the area, accompanied by a crying 2-year-old demanding the potty NOW! How many of them would you be easily able to find within a couple of minutes? And another question for Hong Kong parents: have you ever let your kid pee in the street or other public place because he/she was unable to reach a toilet in time? The massive influx of mainland visitors is responsible for many problems here, but let's not make one poor child's bladder a scapegoat for everything that's wrong with the situation. And maybe the Hong Kong government could consider putting up more signs pointing the way to the nearest public loo - that would be helpful to locals too. "Does anyone care?" 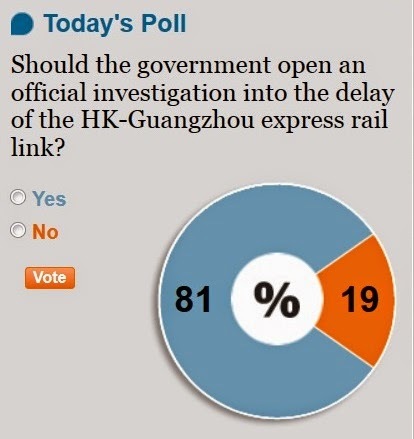 might be a more appropriate question than the one posed by the Pro-China Morning Post. The Hong Kong people never asked to have their hard-earned money spent on this ruinously expensive project, and are hardly likely to be bothered by the prospect of it being delayed by a couple of years. Like our other great white elephant infrastructure projects - the Hong Kong-Zhuhai-Macau Bridge and the proposed third airport runway - the rail link reflects the hubris of the local and mainland governments rather than the real needs of Hong Kong. No big project suddenly slips its timetable by two years - there is always a series of small delays acting as warning signs which gradually accumulate. If the government did not spot these signs, then it was not monitoring the project adequately. Expect the usual response - a round of hand-wringing, at the end of which nobody will be held responsible. 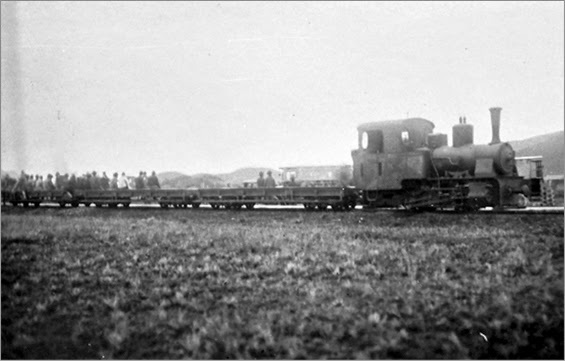 While we're on the subject of railways, whatever happened to the second steam locomotive of the pair brought back to Hong Kong from the Philippines some years ago? One of the pair, which were once used on a long-defunct narrow-gauge line from Fanling to Shataukok, quite properly sits in the Hong Kong Railway Museum in Taipo (see picture above, from Wikipedia). The other appeared to have vanished - rusting away, rumour had it, in the MTR depot at Fo Tan. Since the government acquired it with public money, shouldn't it be on display somewhere where the Hong Kong public can enjoy it? 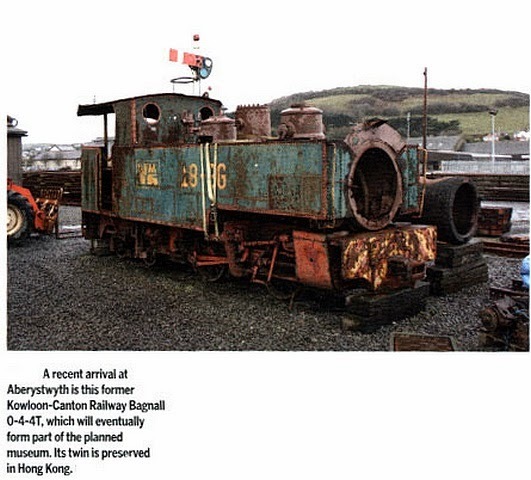 Well, apparently our lords and masters decided otherwise; according to the fascinating Industrial History of Hong Kong website, which has a picture of the line in operation (above), it was intended to restore the second loco to working order, but "after languishing at Fo Tan for several years it was donated to a narrow gauge railway in Wales catering for tourists" - apparently the Vale of Rheidol Railway, since a photo shows it at Aberystwyth (in terrible condition, one might add - see below). Did the Hong Kong government ever ask the Hong Kong public whether they wanted to keep it? Just another example of our money being splashed around without consultation. A member of the electoral reform panel of the DAB has admitted that Beijing “requires a high level of predictability over the [next Chief Executive] election". Apparently he fails to see the blatant contradiction between this and his party's claim to stand for "Democratic" Action for the Betterment and Progress of Hong Kong. One can have democracy or predictability, but not both. Why a Well Women Clinic? Wouldn't it be more useful to have a clinic for sick women? Taipo. "Overpayments Accepted" sounds so much nicer than "We rip you off by not giving change", don't you agree? Market Square, Helmsley, Yorkshire, UK. Hope no one misreads this as "Letter" and tries to pop their mail in there! It does look like a mail box. Somewhere I can't remember in the UK. DAB - hhmmm... Wonder if the Hong Kong government is trying a little subliminal advertising here? You have to admire any hotel that displays Basil Fawlty at its front door! Damn fine beer, too. The Buckingham Hotel in Buxton, Derbyshire Peak District, UK.